A protest against plucking had Shalayna, Vegan Animal Activist, body-painted outside the Toronto Eaton Centre holding a "not down with cruelty" protest sign. 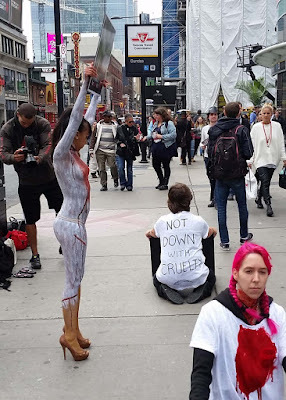 The peaceful demonstration brings attention to the fight against animal cruelty to the heart of the city and she asks 'Please don't buy down!" Many of the feathers used in clothing and comforters come from birds that are restrained and plucked live. PeTA asks that people save the birds from extreme cruelty by using down-like fibres. The Edgy Activist was helped by several activists that held project signs and were splashed with fake blood.